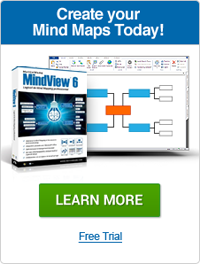 Creating mind maps is fairly easy. The main point to remember is to begin in the center, with one central keyword or idea. Use a large enough piece of paper, poster board, or other physical element on which to draw up the map. Elements are then added around the central starting point, radiating around in a circular fashion. Major concepts are added in bold type, colors or capital letters, and can be organized by importance. Each secondary idea around the central idea will have more branches for additional elements. Use different colors, at least three, to enhance the map and bring in additional power of the creative right brain. Symbols and other graphics are also allowed as desired. Equal ideas should have equal length lines as connectors. All roads should lead back to the central keyword. The circular placement of ideas around the central keyword encourages creative thinking by removing barriers of importance. Once all thoughts are placed, connections should be made from outer small cap words and the central large cap words. It forms a circular branch-like thought pattern that is similar to a roadmap leading to or from a large city in the center. This is different from the restrictive hierarchical thought process involved with creating typical linear structured flow charts and organizational patterns. With mind maps, order is not an issue; work can begin anywhere. The focus is on the one central keyword, not a group of ideas as would be found in a concept map.